Blue Heeler Mining manufactures, markets, hires and services a range of grouting equipment and underground secondary support strand bolt, air hydraulic and hydraulic tensioning systems. The grouting equipment was designed for use in underground mines for top down grouting of cable strand bolts using thixotropic grout, but is now expanded to be used for thin grout in both mining and civil applications as void filling, floor levelling and any other mixing and pumping applications. The stressing equipment that we manufacture passes all Australian Safety Standards including MDG41 all pressure testing certificates supplied along with the Manufacturers Risk Assessment. The tensioning jacks are designed to be light weight with ergonomically user friendly operation. Equipment is presently being used locally and Australia wide including Newcastle, Hunter Valley, Lithgow- Western Districts, Bowen Basin Queensland, Kalgoorlie Western Australia Victoria, New Zealand, New Guinea, Laos, America, Kygyz Republic and Albania. All products are designed and manufactured by people that have used the equipment on the job, something no other manufacturer can claim. 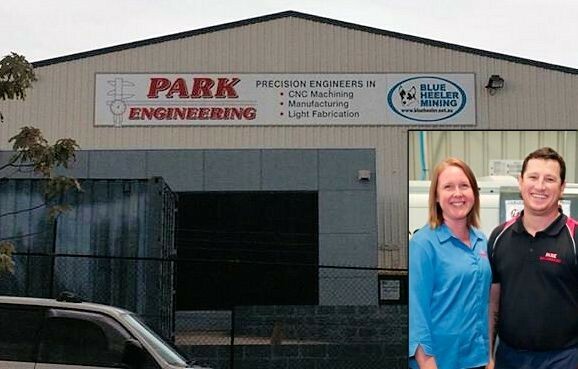 Blue Heeler Mining has a network of authorised suppliers and service agents in the Hunter Valley, Emerald Qld and New Zealand with a stock of new products and spare parts. To keep down time to a minimum Blue Heeler Mining supplies service exchange on most of it’s products. Even if you are in Queensland for a freight cost we can have equipment on your site overnight. We have in stock a large inventory of spare parts to enable us to service any equipment quickly and for a reasonable price. Because we build the machinery and have used the machinery ourselves we know what needs to be done. Even when a grout pump is sent out with the riser tube blocked solid with hard grout we have a process to bore out the riser tube - saving the tube, the grout piston and rod - and saving you half the cost of replacement. All Blue Heeler toolboxes are built out of 1.5mm steel with a few extra folds to make them light but very strong. They are designed to keep out dirt and incorporate a lever for ease of opening.